A little tribute to Apple's mastermind and innovator, Steve Jobs who passed away a few days ago. This is based on a younger photo of him circa 1985, around when the first Macintosh computer was released. This seems “happier” than some of the other drawn tributes I’ve been looking at. Maybe it‘s the optimistic, youthful look? Sharp, as per. 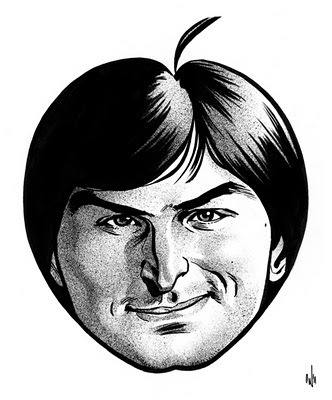 Definitely the optimistic youthful aspect of Steve. More of a 'what once was' rather than 'what he had become' rendition.